I actually wondered (many years ago), "Why Would Anyone Blog?" Ahhh. Never say never to anything in life. Here I am - a blogger. If you really dive into blogging, you will see that bloggers are a smart, creative, helpful, and innovative group of people who are changing the world with their unique voices. When my husband encouraged me (in 2009) to start blogging, I thought he was a bit nuts. I indulged him, however, and started a little Blogger blog called Homeschool Success. Now, almost four years later, Homegrown Learners is such an important part of my life. "How Do You Have TIME to Blog?" I've heard this question so many times. Often, it is from well meaning friends and acquaintances, but the tone in their voice denotes that I certainly must be letting other things in my life slide. Some things in my life have gone by the wayside because of blogging. My children are also bigger now. They are responsible for their own laundry and keeping their rooms and bathroom clean. I am blessed to have a very supportive husband. He gives me time to work on the weekends, helps with so much around the house, and provides a listening ear. People don't say to someone with a part time job, "How do you have time to work?, do they? Blogging is my part time job, and I just happen to love it. It allows me to share my life story, have a voice, and have fun doing it. In the early stages blogging was just what I described - a way to connect, share, and record my life. It is all of those things and SO MUCH MORE than that now. Blogging has given me the chance to use my creativity in a way that benefits eople. Blogging has given me the chance to preserve all of these memories for my family. I love that I can write about the awesome days and the not so awesome days, too. I can look back over the past four years of homeschooling with pride and happiness. Believe me, there are days (when things aren't going so well) that I will go back through my blog and read those happy posts. They keep me going! Blogging has given me the chance to earn a side income. If you do your homework, network, and play your cards right, blogging can indeed provide income. I am so fortunate to be doing what I love and getting paid to do it. I have an undergraduate degree in Music Education and a Masters Degree in Educational Leadership and Supervision. I never imagined I would be WRITING. God's just awesome with all of the surprises He has put in my life. This is probably the benefit of blogging I love the most -- all of YOU. Each week we come together and comment on posts, share ideas, and chat about educating our kids the best we can. I have made lifelong friends through this community, and I know you have, too. Each Friday I visit Collage Friday posts and see you all commenting on each other's blogs. We are harnessing the power of the blogosphere for our children's good, and this makes me so happy. This Wednesday, May 1, there will be a book released. In this book I have authored the chapter, "Growing Community Through Your Blog". This subject is near to my heart, because I love the community that Homegrown Learners has become. This eBook covers literally everything you need to know about blogging. It is a comprehensive guide to starting, maintaining, and growing a blog. It's all about relationship. We hear the catch phrase so often, but what does it really mean? Building relationships with other bloggers and readers is a key to building community through your blog. Do you promote others more than you promote yourself? When you read blogs, do you comment thoughtfully? What are your motivations for all of your online interactions? Are you trying to make lifelong friends online or just befriending people to get ahead? Would you consider being friends in real life with the people you seek out online? Wednesday I will be sharing the link to purchase this book, as well as giving away a copy. *Update! iBlog is now available. Purchase your copy by clicking here. 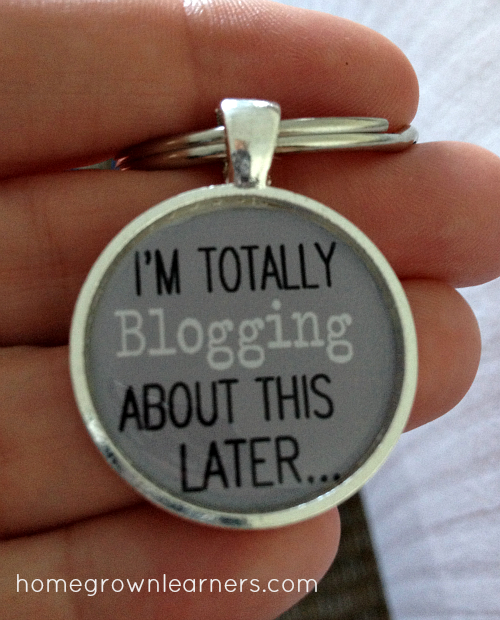 I think bloggers are changing the way we work, live, and do business. Do NOT underestimate the power of the blogosphere! Until then, I'd like to know -- are you a blogger? If you are, WHY DO YOU BLOG? If you're not a blogger, have you ever wanted to start a blog? This week's bundle of the week is a technology & internet bundle, helping you to use technology in your everyday life. I'm esepcially excited to read The Mom's Guide to Evernote!